We’ve been glad to see child care emerge as a key issue in this federal election, with three major parties (Greens, Liberals and NDP) vying to tackle the problems with the status quo: inadequate spaces, unaffordability and inconsistent quality. We analyzed the party platforms on child care in more detail in a previous post. 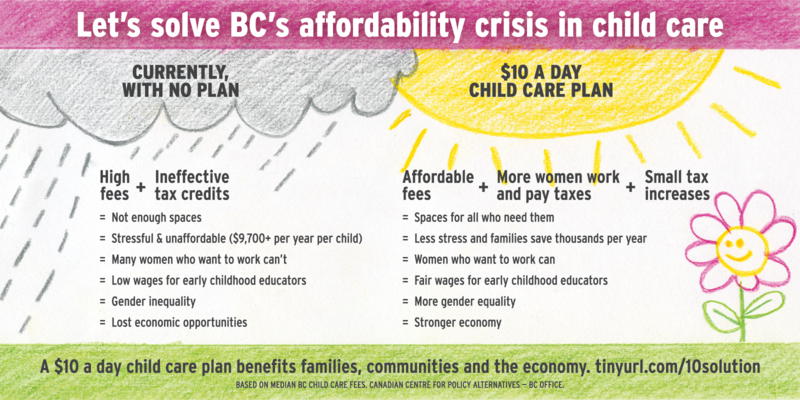 Now we at look at what they mean specifically for financing the BC $10aDay child care plan. Why the $10aDay child care plan? The $10aDay child care plan was developed by child care experts in BC as a framework to transform the existing patchwork of inadequate child care services into an integrated system that provides high quality early care and learning programs to all families want or need them. It draws on best practices and lessons from the international and Canadian research on child care to ensure high quality, enriching early childhood education programming. It ensures affordability by reducing parent fees to $10/day, with no fees for families earning less than $40,000 annually. This plan has gathered support across the province, from families, community groups, businesses, local governments and academics. BC’s provincial government has yet to adopt the $10aDay Plan, but if a new federal government takes leadership on child care nationally, the province could be well-positioned to move forward. How much does the $10aDay Plan cost? It’s estimated that the $10aDay Plan would require $1.5 billion annually in new public investment once it’s fully implemented. However, it will take time to effectively plan and build the kind of system expansion the plan proposes and ensure high quality programming, so advocates and researchers have proposed a 10-year phase-in schedule. This level of spending is consistent with the OECD and UNICEF benchmarks calling for public investment in quality, universal child care at a minimum of 1% of GDP. BC already spends about 0.3% of GDP on early childhood education programs (incl. all-day K) and $1.5 billion is about 0.6% of BC’s projected GDP in 2015/16 (and BC won’t be spending $1.5 billion more per year until 10 years in the future, when GDP would be higher). Nevertheless, the level of public investment required has been a significant barrier to action both in BC and across Canada. Despite the well-documented social and economic benefits of affordable quality child care, no province outside of Quebec invests anything close to the UNICEF benchmarks on early education and child care programs. A recently published CCPA study finds that $10/day child care would be largely self-financing as it enables more women to return to work after parental leave, which would generate large returns for both provincial and federal governments from higher tax revenues, fewer families with children needing social assistance, and reduced reliance on other income-tested supports. Can the $10aDay Plan be implemented under the different federal parties’ child care proposals? Not without federal-provincial partnership. No party platform promises this level of funding. In other words, even if cost-sharing is not highlighted in the party platforms, federal-provincial cost-sharing will be required in order to achieve the universal access to high quality child care proposed in the Plan. Anything less would mean fewer spaces, higher fees or cutting corners on program quality (or a combination of the above). In many ways, a federal-provincial partnership on child care makes a lot of sense. For example, the benefits of child care would be shared by both levels of government, about equally, as recent CCPA research shows. Federal leadership and a national child care program will promote equality of opportunity for Canadian families regardless of where in the country they live, but provincial governments must be active partners to ensure programs are targeted to local needs. So how much will the federal parties contribute in dedicated federal transfers for child care, and when? In BC, the answer to that question tells us how much the province will then have to contribute in order to fully implement the $10aDay Plan. As we noted in our previous post, the Conservative platform does not include a commitment to federal transfers for child care services. This approach leaves the province to fund 100% of the $1.5 billion investment in the $10aDay Plan on its own. That’s not impossible (as recent CCPA research demonstrates), but federal-provincial cost-sharing makes much more sense. The Green platform does not specify the total amount of federal funds the party would make available for child care services over the next 10 years. It identifies dedicated transfer funds that increase annually until reaching $1 billion/year in 2017/18, remaining at that level until 2019/20. The Greens also support phasing out the UCCB and using those funds (estimated at $6.7 billion/year) to further increase the investment in child care services. 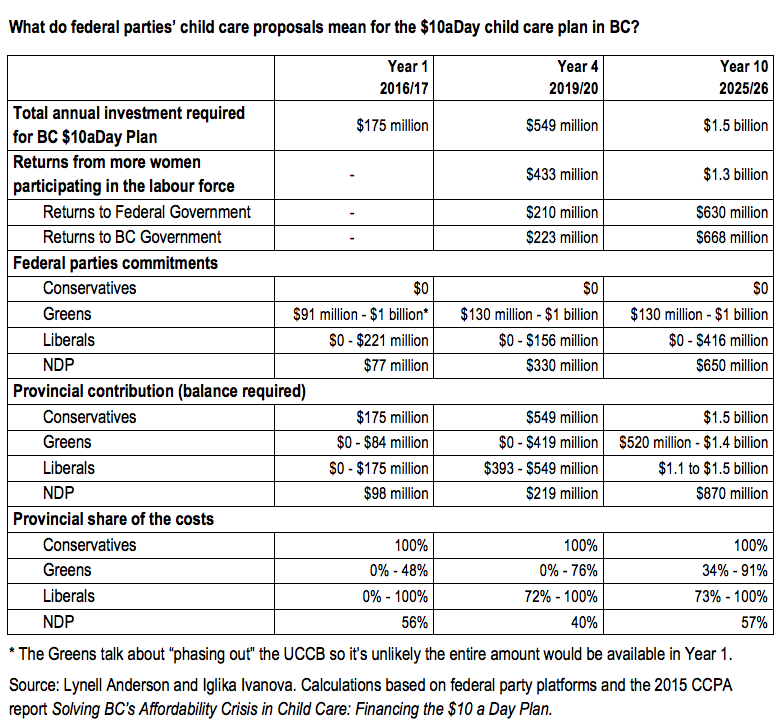 The timing of the UCCB phase-out is not specified and some of the funds would go towards making the child care expense tax credit refundable, but this is nevertheless an impressive pool of federal resources for child care services, potentially the largest of any party platform. Assuming that the minimum Green commitment of $1 billion in year four carries through to year 10, we can reasonably estimate that BC would receive a minimum of $130 million/year in federal child care transfers by year 10 ($1 billion x 13%) and a potential maximum of around $1 billion/year ($7.7 billion x 13%). The Liberal platform rolls child care into a social infrastructure fund, which provides $20 billion over ten years for investment in a number of different priority areas, including affordable housing, seniors facilities and cultural spaces. Provinces would get to decide how the money is allocated, so a province that wanted to prioritize child care could theoretically use the entire social infrastructure fund for that. If fully utilized for child care, the Liberal commitment would provide a maximum contribution of $416 million by year 10 (the social infrastructure amount for year 10, $3.2 billion x 13%). However, there are no funds specifically dedicated to child care, and the social infrastructure amounts are much lower in the earlier nine years (and lower in years three, four and five than in the first two years of the fund), so the Liberal platform could also result in no contribution to the $10aDay Plan in BC. The NDP platform proposes a 60/40 joint federal/provincial child care investment strategy with dedicated federal transfers for child care services increasing annually to reach $2.5 billion/year in four years and $5 billion/year in eight years. We estimate that BC would receive about $330 million in year four ($2.5 billion x 13%) and $650 million in year ten ($5 billion x 13%). Once $10aDay child care is fully implemented, the upfront federal/provincial cost sharing would be approximately 40/60, with the province taking on 57% of the cost of operating the program. Given that the Plan would reduce parent fees to $10/day (which is lower than the NDP platform maximum of $15/day), it’s reasonable to expect the province would take on a larger share of the cost than the NDP’s proposed 60/40 split. While the Green platform potentially commits more federal funds for child care services, the NDP platform provides the highest level of dedicated federal funding that is scheduled in detail over time. It’s time for Canada to invest in a quality, universal, affordable child care. Families with children would save thousands, and more women would be able to return to the workforce after having a baby, or work closer to full-time hours, boosting their family incomes and the economy as a whole. Provincial and federal governments can expect an immediate return in higher tax revenues and less family poverty, which means less demand for social assistance and other family income supports. And the rest of us who don’t have young children in child care can look forward to healthy child development, improved social inclusion, more gender and income equality and economic prosperity. Lynell Anderson is a Family Policy Researcher and a Research Associate with the CCPA-BC. Iglika Ivanova is a senior economist at CCPA-BC and author of the report Solving BC’s Affordability Crisis in Child Care: Financing the $10 a Day Plan.